At least that's what I keep telling myself. 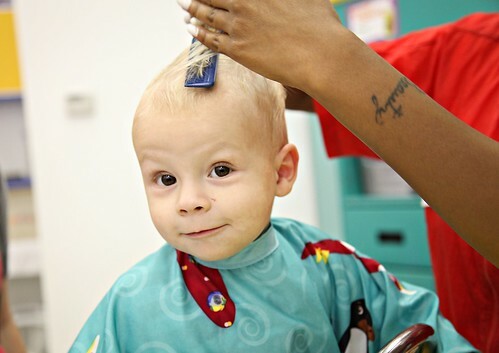 I walked into the children's hair salon telling myself that I wasn't going to get emotional. As you can imagine being 7 1/2 months pregnant didn't help the situation. I was holding back the tears. 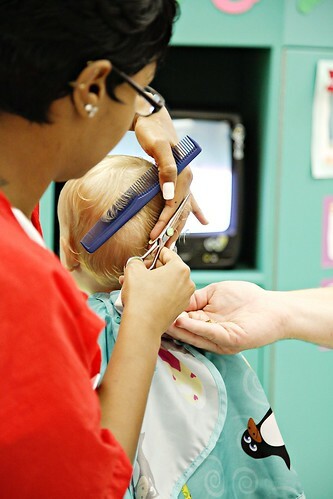 It's actually happening, my baby is growing up and getting his first haircut. I was there with camera in hand to capture the moment and hubby was there too. The hairdresser asked hubby to put out his hand to catch the first few hairs that she cut. Hubby held out his hand and caught them. As I was still snapping away and totally caught up in the moment, I noticed hubby was looking around. "Where's a trash can?" he asked. Almost in unison the hairdresser and I both said, "No, you don't throw that hair away!!" I explained that we are going to save those few locks and put them in little man's baby book. He laughed and placed the locks in an envelope. Little man did great! He actually seemed to enjoy it. Now he doesn't look so scraggly, he looks like a little boy. Yesterday while hubby was out of town I went shopping with my sisters and little man. 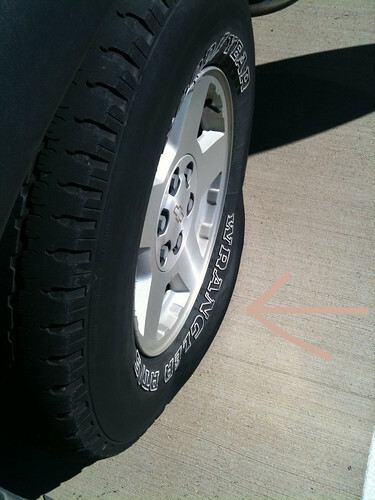 When leaving the store we noticed I had a flat tire. I was thankful my handy sister was with me. She knows how to change a flat! She started to change it when a man walked up and offered to take care of it for us. I'm sure we were quite the sight. (Three women, 1 being pregnant, and 1 baby.) His help was greatly appreciated by us and my husband!! What a doll!! 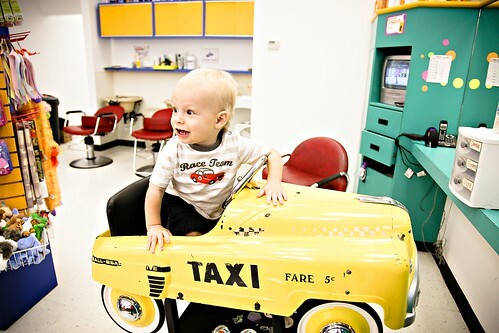 He looks so grown up with his hair cut. . . . and what a cute idea for a salon. I got emotional over both of my kids' first haircuts, Jake was 9 months old, and Brenna was not quite 3 years old. 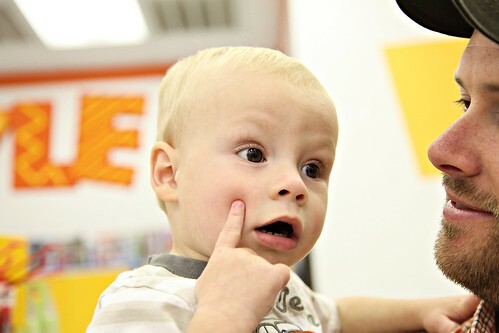 Jake is now 20 months old and gets a haircut by me about every 2 months. Brenna has only had 2 haircuts in 3 1/2 years and I only let them trim it. It will make me soo sad when we acutally cut more than a couple of inches off of her hair. Little Man looks adorable and I can't wait to see what baby Cohen will look like! Awww, great pics! Well if you take at look at my boys, you can see I still have trouble with the haircuts! :) hugs to your littleman! Oh how sweet! 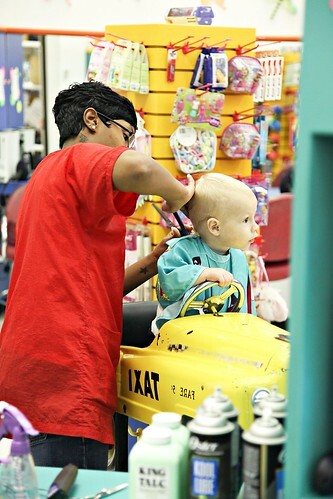 That really looks like a nice hair salon for kids! Poor Wes just gets a chair in our kitchen. :) Funny about your husband not knowing to keep the hair. I'm glad you had a great weekend. This post brings up memories for me! My son had the most beautiful blond curls. I knew once he hit one it would be time to face that first cut. I knew I would face it when I was ready, and make a big deal of it. Take pictures, keep the lock. etc. At the time I was a nanny and took my boy to work with me every day. On this fateful day I just so happened to leave Joshua at home with his biological father that day. When I came home Joshua had a buzz cut. A BUZZ CUT! No beautiful blonde curls. No photos, no locks. SO SWEET! 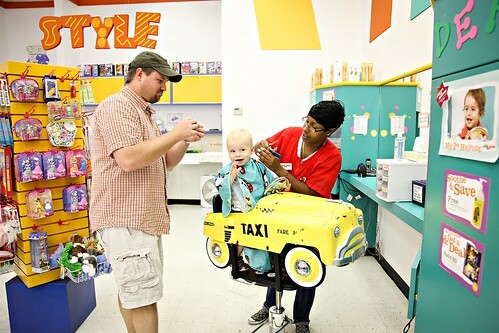 What a fun place to get his hair cut! I wanna place like that for me! 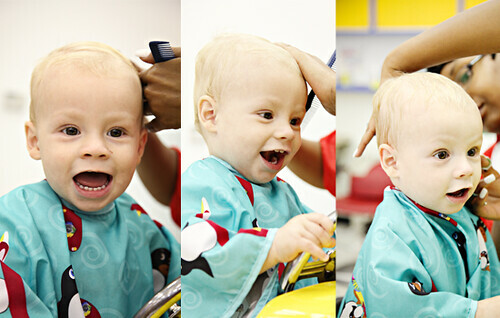 Looks like Little Man did much better than my Tottie with a first haircut! So cute! 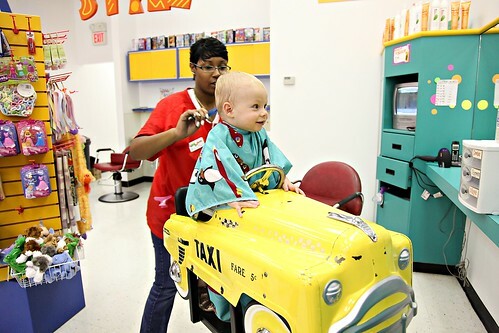 So cute about Little Man's first haircut! 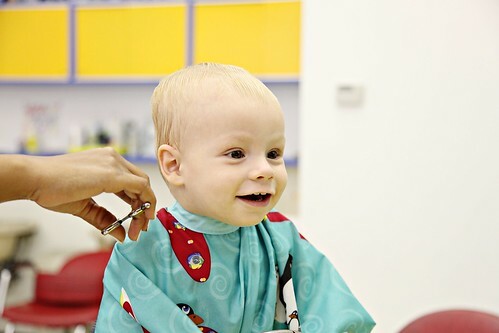 It's amazing how much more they look like little boys than babies after that first haircut!